The DXB 120 is used for process development and small scale production. 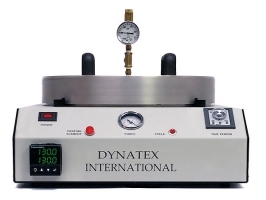 With its larger heated vacuum chamber, the DXB 120 supports larger wafers. The DXB 120 can be used to develop a process that was created on the DXB 525 but needs to be developed for larger wafers. Dual chamber technology allows the operator to manually adjust the bonding pressure. Heated vacuum chamber 11.25" diameter. On board timer is used to set the bonding process duration. Available in two operating voltages – 120 VAC and 240 VAC both single phase. We approached Dynatex International with a unique need of bonding a thin wafer to a thicker and robust wafer. Dynatex was the only company who offered this solution in a quick and efficient manner and also a competitively priced product. Additionally, Dynatex developed a custom process for our product and provided attentive and unlimited support for setting up and developing the process. They went above and beyond my expectations in terms of fast turnaround process development, tool lead time and cost savings. Kierthi Swaminathan, Process Development Engineer, Power Integrations Inc.